The first looks of G500 4×4² have been revealed by Mercedes-Benz. 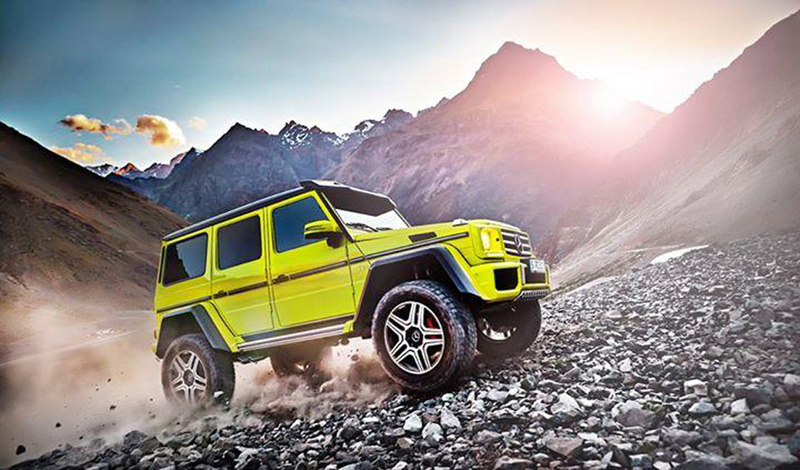 The classy off-roader had been spotted testing in November in G63 specification. The spy photos revealed a model with green body paint. The company then confirmed the model sometime later. The images of this new launch are out now and the vehicle is the four-wheel version of the six-wheeler model. It is like the 6×6 with the axle removed. It runs on a V8 engine that gives a massive 422 HP. The 5.5-liter V8 engine is present in the regular G500. This one gives a slightly lower power of 387 HP. The exterior features larger 22-inch wheels along with the off-road 325/55 tires. The body has been modified and carbon fiber attachments can be seen. The fenders have been widened. Mercedes-Benz is still to reveal the remaining details of this model. Chances are high that the all-new G500 will make its public debut early in March at Geneva Motor Show. They are currently calling it a show car but it will go into production later in 2015. It would be production-limited and is expected to be cheaper as compared to the AMG 6×6 which that comes at € 451,010 in Germany.